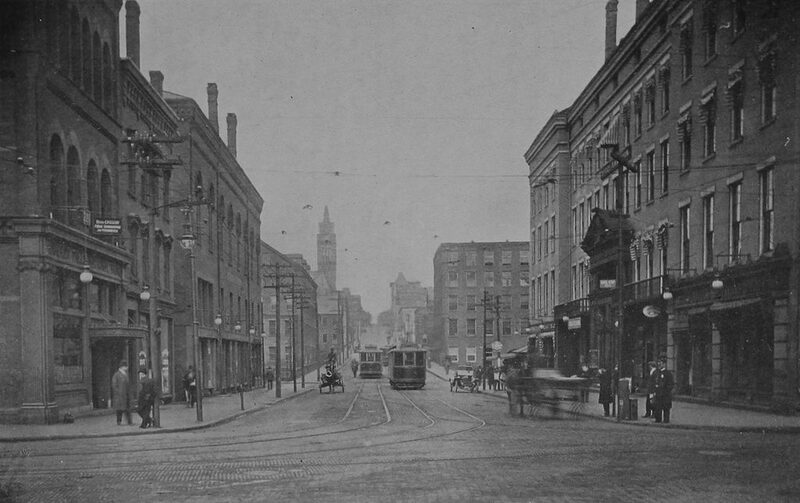 Looking west on Dwight Street from the corner of Main Street in Holyoke, around 1910-1915. 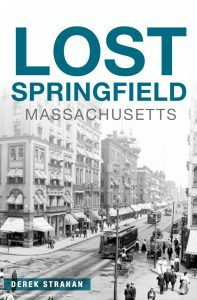 Image from Illustrated & Descriptive Holyoke Massachusetts. This scene shows a view similar to the one in an earlier post, but these photos were taken a little further back, showing the entire block of Dwight Street between Main and Race Streets. The first photo here, taken around the early 1910s, shows a busy Dwight Street, with a mix of trolleys, automobiles, and what appears to be a blurry horse-drawn carriage. On the right side of the photo is the Hotel Hamilton, which was built in 1850 and expanded and renovated in 1889-1890. Among its ground-floor tenants at the time was the Mechanics Savings Bank, which occupied the storefront on the far right side, at the corner of Dwight and Main Streets. Another bank, the Hadley Falls National Bank, was located directly across the street, in the building on the far left side of the first photo. Another important building in the first photo was Parsons Hall, the third building from the left side of the photo. Also known as the Chapin Block, it was apparently built around the early 1850s, about the same time as the hotel across the street. Its large third floor, which took up about half the building’s height, housed an auditorium that was used for a variety of events throughout the 19th century. Several local churches, including the Unitarian Church and the French Congregational Church, temporarily worshiped here before constructing buildings of their own, and high school graduations were also held here for many years. The actress Eva Tanguay, a French-Canadian immigrant to Holyoke, made her stage debut here as a young girl in the 1880s, before going on to have a successful career as one of the most famous vaudeville performers in the country. 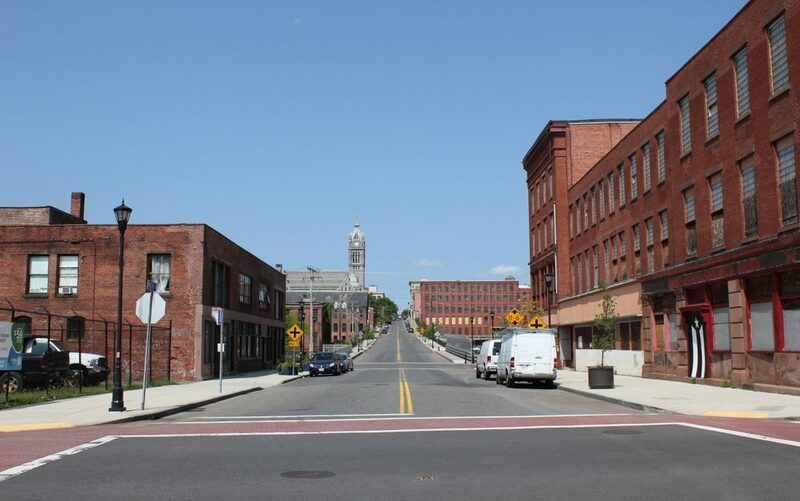 Further up the street, the first photo shows several of Holyoke’s factory buildings. On the left, just beyond Parsons Hall on the other side of the Second Level Canal, was the mill of the Beebe & Holbrook Paper Company. It was built in the early 1870s as the Hampden Paper Company, but later became Beebe & Holbrook in 1878. Then, in 1899, it became a division of the American Writing Paper Company. This trust included many of Holyoke’s paper mills, and controlled a significant portion of the nation’s writing paper supply. However, other Holyoke mills remained independent, including the Whiting Paper Company, whose mill is visible on the other side of Dwight Street, just beyond the Hotel Hamilton. Further in the distance, hidden from view in the first photo, was the William Skinner & Sons silk mill, and at the top of the hill was Holyoke City Hall, with its tower rising above the factories. Today, there are still some identifiable buildings from the first photo, but most have undergone significant changes. Some of the Beebe & Holbrook buildings are still standing, but the one that is most visible in the first photo is gone. Similarly, several of the former Whiting buildings are also still there, but not the one shown in the first photo. Closer to the foreground, the Hotel Hamilton building now stands vacant. It was dramatically altered after the hotel closed in the early 1940s, including the removal of most of the fourth floor. Most of the storefronts have also been altered, except for the former Mechanics Savings Bank on the far right side, which still retains its early 20th century appearance. On the other side of the street, Parsons Hall similarly lost its upper floor during the mid-20th century, and much of its Dwight Street facade was also rebuilt. However, the rest of the building is still standing in its heavily-altered appearance. Its neighbors to the left are gone, though, including the former Hadley Falls National Bank building and the site is now an empty lot at the corner of Main Street. 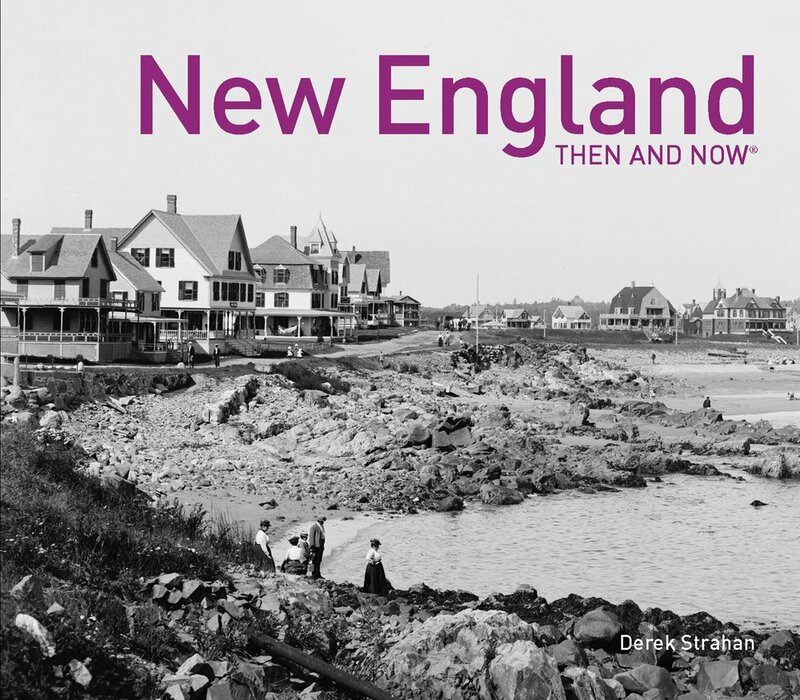 Overall, the only building that has survived from the first photo without any significant changes is city hall itself, which still stands in the distance at the corner of Dwight and High Streets, and remains in use as the seat of the municipal government.